How to Jailbreak iOS 7, 7.0.3, 7.0.4 for iPhone, iPad, iPod? 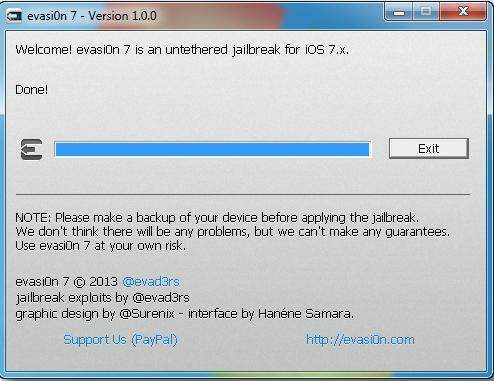 After a few months of waiting, the Evad3rs team finally released the untethered jailbreak for iPhone, iPad, and iPod Touch running iOS 7 through iOS 7.0.4. The jailbreak process is surprisingly simple, taking only five minutes to complete and works on both Mac and PC. Jailbreak is great but there's always a risk of bricking your phone such as White Apple logo if something goes wrong. However, if you've been waiting three months for jailbreaking, then go forth and follow steps blew to jailbreak red iPhone 7/SE/6/5s/5c/5/4s/4, iPad Air/4/3/2/Mini, iPod Touc 5G on iOS 10/9/8/7. Note: The version of Cydia included in the jailbreak is not official and therefore untested. So backup your iPhone/iPad/iPod Touch before iOS 7 jailbreak to avoid any data loss after jailbreaking. Part 2: How to Jailbreak iPhone, iPad, and iPod Touch running iOS 7 on Windows? After backing up your device and prepared all the requirements, now you can start the jailbreak process. Below we take iPhone for example and please make sure you have no passcode lock on your device. This is a guide for Windows, for Mac go to Part 3. 2. As the evad3rs suggest a full restore before performing the jailbreak, you'd better download the latest iOS 7.0.4 firmware for your device into the Pwnage folder. 3. Extract the Evasi0n zip file to the Pwnage folder on your desktop. And launch iTunes. 4. Connect you iPhone to the computer via USB and select it from the left sidebar in iTunes. 5. Press and hold the Shift key and click the Restore iPhone... button. From the popup window that appears, select your iPhone firmware ipsw from the Pwnage folder we created on the desktop and click Open. Then click the Restore button to confirm to restore. 6. After restoring successfully, right click the evasi0n7.exe icon then select Run as Administrator from the contextual menu to launch the application. 7. Click the Jailbreak button to begin. Make sure you have removed any lock screen passcodes on your device. 8. Evasi0n7 will automatically retrieve from the device to generate jailbreak data, upload jailbreak data, inject evasi0n app 1, inject evasi0n app 2, configuring system 1, configuring system 2, and then reboot. 9. Then Evasi0n7 will prompt you to unlock your device and tap the new ‘Evasi0n7' app icon. Just tap the app on your device. The app will open and close immediately. 10. Now Evasi0n will then reboot the device again, modify rootfs. After that you'll find the device has jailbroken successfully and your iPhone will now reboot with Cydia on the SpringBoard! Part 3: How to Jailbreak iPhone, iPad, and iPod Touch running iOS 7 on Mac? 2. Download the latest iOS 7.0.4 firmware for your device into the Pwnage folder to perform a full restore before jailbreaking. 3. Double click the Evasi0n dmg file from the Pwnage folder on your desktop to mount it. 4. Drag the Evasi0n application from the mounted dmg into the Pwnage folder on your desktop. 5. Run iTunes and connect your iPhone to Mac with USB. Select it from the left sidebar or the top right corner of the window. 6. Press and hold the Option key and click the Restore iPhone... button. From the popup window that appears, select your iPhone firmware ipsw from the Pwnage folder we created on the desktop and click Open. Then click the Restore button to confirm to restore. 7. After that right click (or control+click) the evasi0n app icon from the Pwnage folder, then select Open from the contextual menu to launch the application. 8. Click "Jailbreak" to begin jailbreak. Be sure that no lock screen passcodes on your device. 9. The app will retrieve information from the device to generate jailbreak data, upload jailbreak data, inject evasi0n app 1, inject evasi0n app 2, configuring system 1, configuring system 2, and then reboot. 10. Unlock your device and tap the new 'evasi0n 7' app icon on it. The app will open and immediately close. 11. After Evasi0n reboots the device and modifies rootfs, you will jailbreak your device successfully. Your iPhone will now reboot with Cydia on the SpringBoard! To sum up, we have introduced the way to jailbreak iOS 7 on Windows and Mac. If you want to jailbreak your device, just follow our introductions.